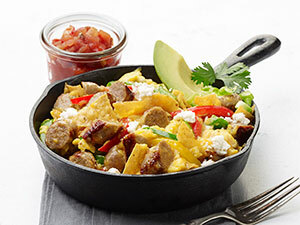 This is an amped up Mexican breakfast skillet without the potatoes. The use of turkey sausage allows this dish to remain on the lighter side. 1. In large skillet, melt butter over medium-high heat. Add diced breakfast sausage and chili powder; saute until light brown. 2. Reduce heat and add eggs, salt and pepper; scramble until large clumps start to form. Add cheese, onions and peppers; continue scrambling until eggs are soft. 3. Add corn tortillas and mix well. Serve each portion in a hot 6-inch cast-iron skillet with 1 ounce queso fresco and garnish with an avocado slice and cilantro sprig. Serve salsa on the side.